Super-collector's item reissued on superior-sounding HQCD! 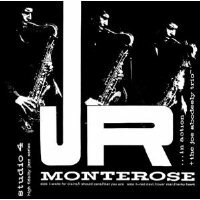 J.R. Monterose In Action was recorded by Studio 4, a minor label located in Rock Island, Illinois in 1964. Because of the quality of the performance, and since so few copies were pressed, the original LP became a super-collector's item, now commanding well over $1,000 in the used market. The VSOP label reissued it on vinyl in 1980, but the CD version of this legendary album has not been reissued in the past 20 years. Tenor giant J.R. Monterose was staying at Cedar Rapids when this album was recorded, and was supported by top-tier musicians in the area. The leader of the trio was drummer Joe Abodeely, who owned the only jazz club in Iowa at the time. Pianist Dale Oehler later moved to Los Angeles to become a successful studio musician and arranger. Despite its humble provenance, the quality of these tracks -- both in terms of performance and sound quality -- is close to the best of that period. The powerful sound of the recording is well preserved in this superior-sounding HQCD with brand-new DSD remastering. Recorded in Rock Island, Illinois, 1964. Mono. DSD remastered in 2011. Japanese, paper sleeve (mini LP) limited edition. HQCD (High Quality CD) is compatible with all regular CD players.